Genuine Apple product. just power cord. Magsafe 2 DC Power Cable Cable for Apple Macbook 60W Charger T-shaped Type: Magsafe 2 power supply cable Product type: AC & DC 5-pin magnet Compatible with: 60W Cable length: approx 1.8M Brand Unbranded MPN Does not apply EAN 4895187104278. Support 85W, also can be used for other DIY purposes. Compatible for all 85W AC Power Adapter for Apple Magsafe 2 Compatible with the MacBook Air Pro After 2012 year. for Apple 14.5V3.1A Rectangular-shaped 5-pin Magnet for Apple 14.5V3.1A Square-shaped 5-pin Magnet. 1 AC cord 4.92ft. 1 USB-C DC cord 5.91ft. Total USB output: 5V/ 4A. Each USB output: 5V/ 2.4A. Lenovo X1 Yoga / X1 Yoga 2nd / X1 Tablet / X1 Tablet Gen 2 / X1 carbon 5th / Yoga 370 / Yoga. Ordering our compact & creative & multi-functional laptop adapter now and enjoy taking it for boost-power wherever you go! Magsafe 1 DC Power Cable Cable for Apple Macbook 60W Charger L-shaped Type: Magsafe 1 power supply cable Product type: AC & DC 5-pin magnet Compatible with: 60W Cable length: approx 1.8M Brand Unbranded MPN Does not apply EAN 4895187104247. An Apple power lead, with a EU mains plug one end to an MacBook Power adapter - extension lead. Genuine Apple Mac Extension Power Lead for MacBook laptop series. Approx 1.8m long and made by for Apple in the distinctive Apple white. 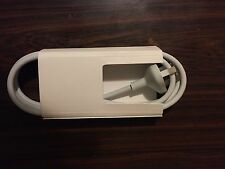 Genuine Apple MacBook Power Cable Extension. US Plug. Apple MagSafe extension cable with US plug. Fully working and in good condition. MacBook Pro. MacBook Air. 5 Pin Magnetic. If you are not satisfied with the item, you can. Magsafe 1 DC Power Cable Cable for Apple Macbook 85W Charger L-shaped Type: Magsafe 1 power supply cable Product type: AC & DC 5-pin magnet Compatible with: 85W Cable length: approx 1.8M Brand Unbranded MPN Does not apply EAN 4895187104254. Magsafe 1 DC Power Cable Cable for Apple Macbook 45W Charger L-shaped Type: Magsafe 1 power supply cable Product type: AC & DC 5-pin magnet Compatible with: 45W Cable length: approx 1.8M Brand Unbranded MPN Does not apply EAN 4895187104230. Power Cable extension lead cord macbook mag safe mac charger UK plug Apple . Condition is Used. Dispatched with Royal Mail 1st Class. This sale is for a Genuine UK Magsafe power lead. 11" 13" & 15" MacBook, Macbook Pro, MacBook Air. 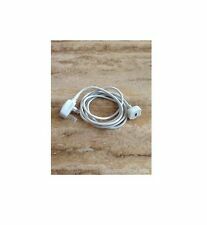 You can be sure these are 100% genuine Apple ones not copies, they have the Fused plug and the cable is of high Quality. EU Macbook extension cable for macbooks (45w, 60w, 85w). High quality 1.8m cable. This is one of the quickest ways to get a quick reply. Magsafe 2 DC Power Cable Cable for Apple Macbook 45W Charger T-shaped Type: Magsafe 2 power supply cable Product type: AC & DC 5-pin magnet Compatible with: 45W Cable length: approx 1.8M Brand Unbranded MPN Does not apply EAN 4895187104261. Power Cable extension lead cord macbook mag safe mac charger UK plug Apple. Condition : Brand New - Original Dispatched with Royal Mail 2nd Class. Returns not accepted. Compatible for all 85W AC Power Adapter for Apple. Magsafe 2: Fit for the MacBook Air Pro After 2012 year. F or Apple 14.5V3.1A Rectangular-shaped 5-pin Magnet for Apple 14.5V3.1A Square-shaped 5-pin Magnet. This sale is for a Genuine UK Magsafe power lead. 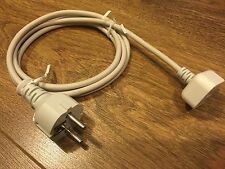 X 10 pieces You will Get 10 extension cords. 11" 13" & 15" MacBook, Macbook Pro, MacBook Air. You can be sure these are 100% genuine Apple ones not copies, they have the Fused plug and the cable is of high Quality. MacBook Pro. MacBook Air. Aluminum T plug. If you are not satisfied with the item, you can. Support 85W, also can be used for other DIY purposes. Compatible for all 85W AC Power Adapter for Apple Magsafe 1 Compatible with the MacBook Air Pro Before 2012 year. for Apple 14.5V3.1A Rectangular-shaped 5-pin Magnet for Apple 14.5V3.1A Square-shaped 5-pin Magnet. For Macbook Pro 11" 13" A1436 A1465 A1466. Compatible Macbook Pro Models Compatible Power Adapter Models. Australian plug. Power: 10A 250V. 61W promise that charging fast, stable and efficient. Pin Size/ Type 5Pins Magsafe 1 with L-Shape Tip. 661-0443,661-4485,661-4259,661-4339,6661-4269,For Apple MacBook Pro(A1181,A1184,A1330,A1342). Adapter Type UK Wall Plug Type Adapter. 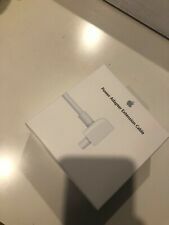 This 100% Genuine Apple Product is New but has been stored in a Box loose with many other Apple Adaptors so will have some light surface marks on them all. They all come with a 1 Year Warranty. This item will be posted on the Same Day that payment is made. (2pm Deadline) If you have any questions, just Contact Us by eBay Message or Phone. (Phone Line open Mon-Fri 9am-4pm) I have included lots of photos below of the item :) - click to enlarge. This item is used, cleaned, tested and is in perfect working order. Item will show minor signs of wear, but this will not affect the functionality of the item in any way. Magsafe 2 DC Power Cable Cable for Apple Macbook 45W 60W 85W Charger T-shaped Type: Magsafe 2 power supply cable Product type: AC & DC 5-pin magnet Compatible with: 45W 60W 85W Cable length: approx 1.8M Brand Unbranded MPN Does not apply EAN 4895187104278. Magsafe 1 DC Power Cable Cable for Apple Macbook 45W 60W 85W Charger L-shaped Type: Magsafe 1 power supply cable Product type: AC & DC 5-pin magnet Compatible with: 45W 60W 85W Cable length: approx 1.8M Brand Unbranded MPN Does not apply EAN 4895187104247. For Macbook Air 11" 13" A1244 A1374 A1369 A1370 A1237 A1304 A1377. Compatible Macbook Pro Models Compatible Power Adapter Models.